With more than 35 years of experience between them, brothers Dave and Jason Browning have earned a reputation for quality workmanship completed in a timely fashion. Their beginnings consisted of small jobs, doing work from home renovations to storefronts and custom homes. Today they are evolving, completing larger commercial projects and building on their reputation and dedication to workmanship. b3 Glass Ltd. is the brainchild of two brothers and two companies who have worked together for years. 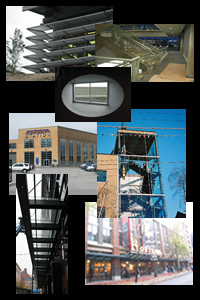 It was established to bring a unified face to Rapid Installations and Polaris Glass. They have leased a 4,600 square foot shop with a view to providing services to both commercial and residential customers. Who is b3 Glass Ltd.? in 2002, Dave and Jason teamed up and began supplying material and labour for smaller jobs and labour contracting large commercial projects for other glass companies. Both are committed to being in business for many years and will provide quality workmanship and customer service in order to build a strong reputation in the industry. We have moved! We are now located at 3819 Myrtle Street in Burnaby. Check out one of our project completions.